Off the Path finally has its own hosted site! You can find it at: http://www.offthepathjournal.com. This blog will no longer be in use – please connect with me over at the new site. Thank you for visiting! infuse its rooms and inhabitants. the Song of loved ones. 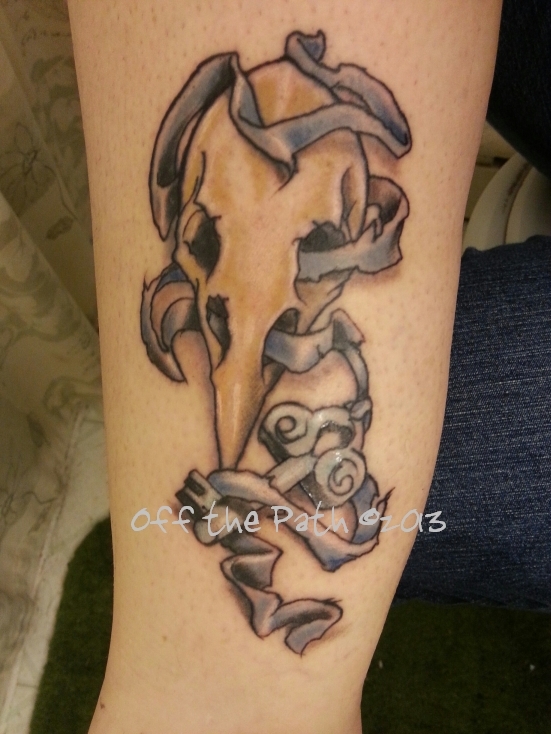 Having Anubis tattooed on me was an amazing way to honor and share my relationship with him. 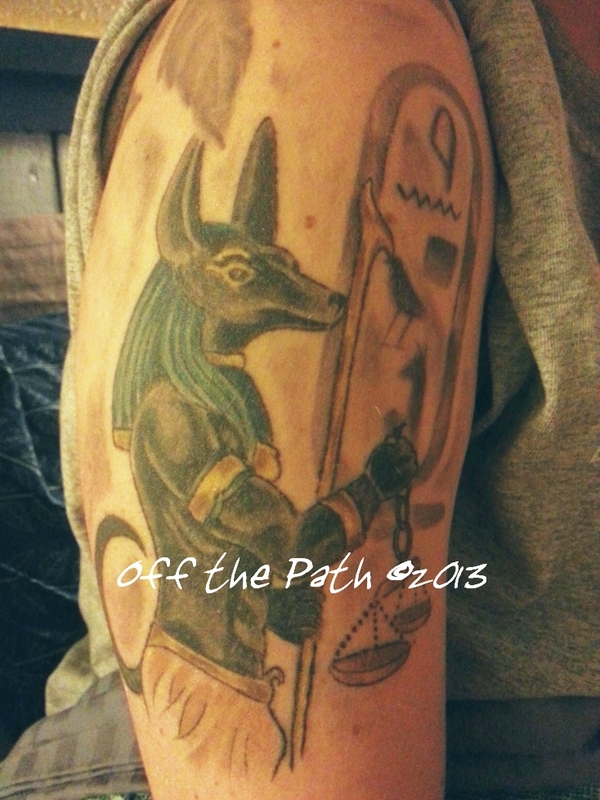 Joe was kind enough to squeeze in the first stage of the tattoo (the figure of Anubis without background) on short notice, right before I went to Florida this winter to help with a memorial for my mom and grandparents. At the toughest moment during the service, I caught sight of him out of the corner of my eye and a great feeling of peace and calm came over me, and I understood why Anubis and I connected when we did. 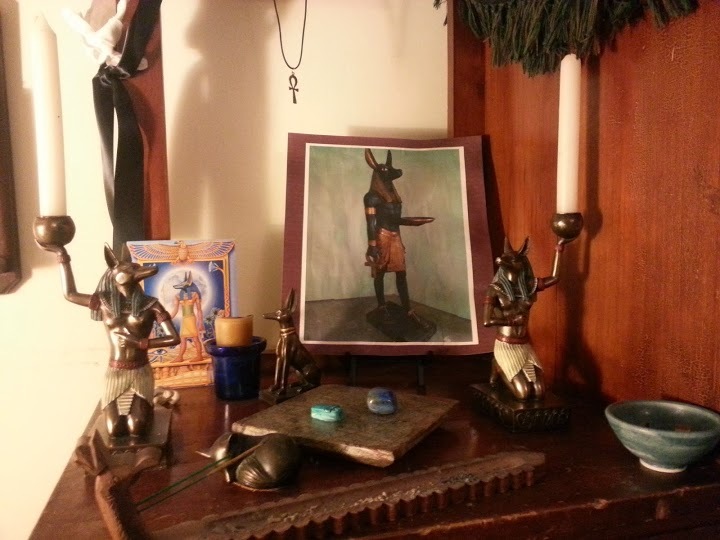 My permanent alter to Anubis which resides in my bedroom. It felt, as I was preparing my dedication ritual, like I had only done this for the first time a short while ago – not a whole year ago. But it has been a year. More than. I’ve learned an amazing amount in that time – both about Anpu and the Egyptian pantheon, but also about the path I’m treading, and what I want to learn and experience along the way. I had some major life events during that year, and I honestly don’t know how I would have gotten through some of it without Anpu. Less than a month after dedicating myself to Anpu, my mother died unexpectedly, followed a few weeks later by my grandmother. A few months after that I was diagnosed with breast cancer, and my grieving had to take a back seat to my medical treatments (I’m happy to report that I’m cancer-free following surgery and radiation). At the worst and bleakest moments, there was Anpu’s presence – warm, comforting and patient when I was too consumed to look for his guidance. One thing I’ve learned is that he’s always with me – I’m the one who isn’t always paying attention. But when I do, he’s there, ready to remind me that I’ll always have his love and guidance. Wrapped in there was the continuation of my spiritual journey – joining a coven, being initiated into the Chthonioi Alexandrian tradition, growing my Pagan family, and reading, journaling and practicing as much as I could. There have been times – too many to count – when my depression felt so overwhelming, I wondered how anyone ever manages to find spirituality in the face of life’s challenges. But I keep working to broaden my perceptions. And as I do, I find many of my practices coming easier – meditating, doing rituals, worshipping – though I’m still easily waylaid by my emotional swings and physical challenges (although cancer treatment is basically done, my immune system is shot due to the radiation, and illnesses and infections have been nearly constant since the end of the summer). As I’m sitting here writing, I realized that I haven’t introduced Thorin yet. Thorin is my wonderful German Shepherd who came into my life a few weeks before the spiritual retreat I went on where I found Anpu. There is clearly a connection between them, and I’ll have to share more about him in a future post. And finally, a really great but unexpected bonus has been meeting other followers of Anpu through my blogging – I’ve loved hearing other people’s stories of their experiences with Anpu/Anubis, and hope to continue to hear from you folks. It helps remind me that I’m not alone, as I so often feel when I’m not with my Pagan family. I hope my blogging does the same for others on occasion. Beltaine and Samhain – Summer’s beginning and its end, are viewed as liminal periods, a time when the separation between the worlds of mortal living and the supernatural is thin. Myths of many cultures describe individuals who have broached this barrier. Driven by love, a desire for knowledge, power, or wealth, or simply by accident, those who make the journey successfully return transformed by encounters with Gods and spirits. Mystery traditions for the last two thousand plus years have recreated these stories to give initiates that sense of wonder and communion with the Powers. In that tradition, this samhain, the SEF has turned to the Norse sagas to create an experiential journey between the worlds, a chance to greet the Gods face to face. Please note that participants will be walking on trails through the woods, and should wear appropriate clothing. In the event of truly inclement weather, another indoor ritual is planned. I wrote a bit on the Withywindle Blog a few weeks ago about some of the life challenges I’ve been facing, including the death of two family members and a diagnosis of breast cancer, all within about a 3 – 4 month span. I will write more about my surgery and recovery when I’m ready to hash it out, but for the moment, just wanted to give some background for the other events in my life. I’ve been following my inclination to learn more about Shamanism. Not with the intent of ever becoming a Shaman, mind, I have mixed feelings about using that term, and am quite sure it won’t ever apply to me no matter how long I study Shamanism. But I’m drawn to it all the same, and am working on understanding how my new explorations will get incorporated into my Craft practices. A few weeks ago I did a meditation designed to seek out a Totem animal to work with. The term Totem Animal to me feels Shamanistic all by itself, and I’ve discovered that I prefer the term ‘Familiar’ when thinking about animals on both the physical and astral plane to work with. I’m going to fight my urge to go into detail about the meditation itself, as I’m more interested in sharing its results. So below I’m listing the books I’ve found helpful for guided journeying and meditating. I was really keen to be as open to animal energy as possible – I already know that Coyote is a Familiar of mine (I’ve called him a Totem Animal in the past, but I’m working on being consistent as my understanding evolves and grows) – even if he is a bit elusive. I suppose that’s to be expected with a Trickster for a Familiar. So I didn’t look to Coyote specifically, just kept myself open to whatever energy was willing to be receptive. I was totally surprised and delighted that Spider acknowledged me – not just that but she climbed up on my left shoulder as I went to leave my meditative state, and has stayed with me. With all the weird influx of male energy in my life (that’s a whole different post….) I’m really glad to have a grounding female presence to work with in Spider. I haven’t actually worked to engage her in spell work yet – I’ve been working through the new and waxing moon on a project that will be complete on Saturday for the full moon, and I’m interested to see what kind of reception I get from her on Saturday. Obo and I managed to get out to the Massachusetts Tattoo and Art Festival for the second year in a row. I had promised my tattooist that I would show the back piece he finally finished, so I was kinda committed. We had both decided to get ink while there – I was looking for something irreverent, as I tend to put so much thought and effort into each piece that I get that it takes years for me to figure out what’s next. Obo was completely undecided; he’s working on an idea for a 3/4 sleeve on his right arm, and figured he’d get something small on his left upper arm in the meantime. I’d kept one particular artist in mind, as her work is both beautiful and intriguing, and headed off to see her first. Jak, like several artists there, had an array of art she was looking to do at the show. Each piece was a one-time-only, so the person who bought the image first was the only one to receive it as a tattoo – ever. She had a beautiful drawing of a bird skull and a key, connected by an intertwining ribbon. Oddly enough, I’ve had the idea of a key in a tattoo design rattling around my brain for a while, but no concrete ideas on what else to do with it. This particular image was perfect. Jak has a completely different style from anything I’ve gotten thus far, and the piece was oddly (and unintentionally) meaningful. Death (represented by the bird skull, in this case) is a transition; in the Tarot, the Death card represents change (among other things). 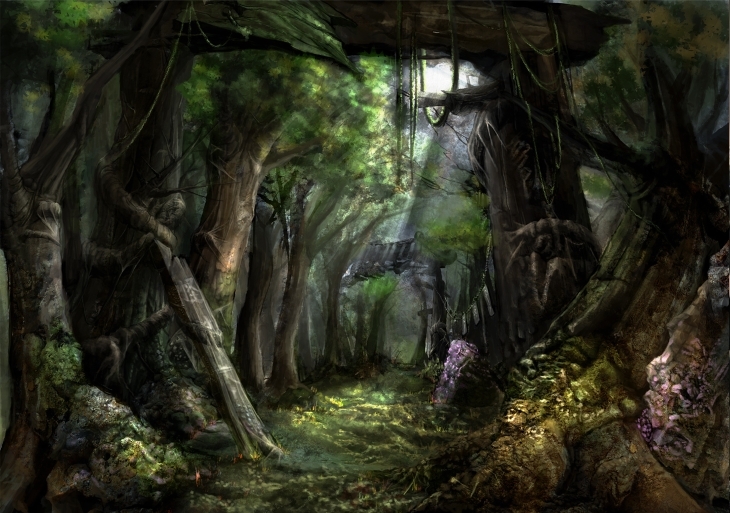 Obo (dream interpreter extraordinaire) told me later that keys, when seen in dream image, represent the self. Thinking of it this way, this particular image clearly represents (to me, anyway) the transitional period I’m currently in. I have no idea where it’s leading, but I know Anpu is with me throughout it. Obo wouldn’t let me see the piece he got until it was completed. 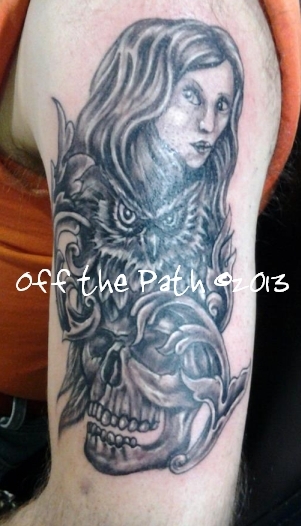 He said when he saw it, it spoke to him of the three phases of our existence – past (represented by the owl), present (represented by the woman) and future – the skull. 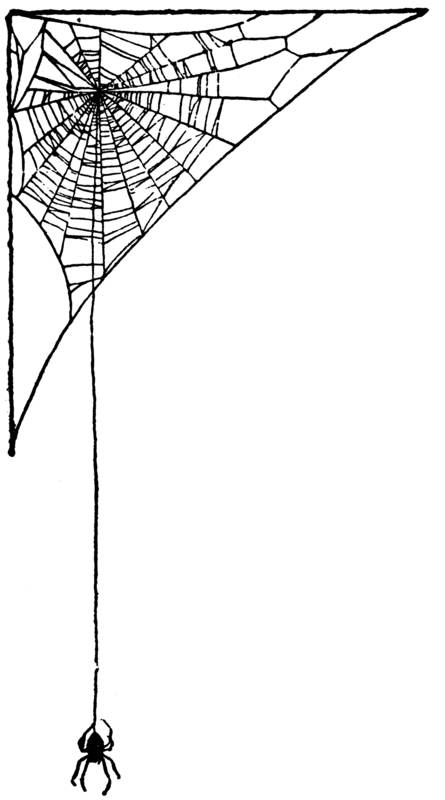 This image was also a one-time-only, done by Sticky. I know skulls have been rather popularized lately by our culture, clothing and whatnot, but still, their symbolism is worth paying attention to. Whether they’re representative of death, change, initiation or anything else, they’re a potent symbol. Over at Withywindle Nature, I posted about losing my mother very suddenly a few weeks ago. This necessitated an immediate trip out to southern CA to be with my brother and take care of my mom’s affairs. Among the items hastily packed were two books on ancient Egyptian culture. I intended to also bring a picture of Anpu (Anubis) with me, as a reminder of his love and support – especially since I was having to deal with death so directly. The picture was forgotten in the rush to get out the door, and only when we were in the air and I was reading one of my Egyptian books on the plane did it occur to me. Well, I figured, it’s not like I don’t know what he looks like. But I love having images of him around to bring me back to focus on him when I might not do so otherwise. A beautiful painting of Anpu done on papyrus, lovingly framed. I gave an audible gasp, and heard Obo behind me say, “Oh wow, its Anubis!” Of all the artwork that my brother owned, this one was the only one that wasn’t piled behind boxes or other pieces of art. It was just sitting on the floor by itself, facing out. Waiting for me, it seemed. I didn’t ask why it was out, I just made sure to visit with Anpu every day we were there, and to thank him for finding me. I love these little moments of synchronicity with Anpu. Finding him in unexpected places, learning his teachings in daily life, as opposed to on a page… I feel so blessed to have this relationship with him. It’s funny how personal the relationship feels – similar to the beginning of a romance. I’m so delighted when he shows up unexpectedly in my life – it’s like getting roses from a lover. One other item of note along these lines. With all the tasks we had to run around and do, we kept coming back to one particular plaza almost every day. It had a cafe, bank and consignment shop, each of which we ended up at multiple times during our trip. Oh, and a vet hospital. The Bastet Veterinary Hospital, no less. Just about a month ago, I chose to dedicate myself to the Egyptian God of the Dead, Anpu (more popularly known as Anubis). Since then, I’ve been visiting with him almost daily – sometimes just a quick, quiet moment away from the rest of life, other times more focused meditating – and reading as much literature as I can that ties into his role and function in Egyptian mythology (I’ll list resources below). To follow Anpu is to seek challenge and have a willingness to face one’s fears. Perhaps I need to figure out what challenges and fears are before me… why Anpu has come to me now. Is he here to help me move forward? Anpu guides us into the future – he brings us through our initiation complete, and into our new life. We are complete for he has overseen the Opening of the Mouth (and I, fortunate enough to have gone through this ritual – indeed, it is how we found each other – know that it is done with love and attention). “Death is his realm, he will guide us to the netherworld.” Anpu awaits me when my time to leave my bodily form has come. Knowing that he will be there to greet me with love and openness brings me more comfort than I ever could have imagined. Anpu is the Master of Secrets, ‘The Dog Who Swallowed Millions”. He is loyalty, change and metamorphosis. Hmm… so where to now? My reading will continue – in the resources I’ve listed below is a book that I plan on adding to my library in the next month or so. I’m contemplating really drawing all of my practice into the Kemetic path, but am not quite ready to make that leap just yet. I’ve rather prided myself on keeping my practice open, and feeling free to draw from whatever resources work for me. I don’t think that will change, and I certainly will be working most directly with Anpu for quite some time anyway, but I’m not certain yet how I will take to following one path specifically. The Mummy: A Handbook of Egyptian Funerary Archaelogy I really like this book – it’s much easier to get through than the Book of the Dead, and information is laid out in a very straightforward manner. Elements of Egyptian Wisdom Found this book randomly in a used bookshop in the middle of the Catskill Mountains. Next to the shelf it was sitting on was a picture of Anpu. Nice. A very different look at Egyptian mythology than the two books above. Really like the way the Gods and Goddesses are introduced here. The Kemetic Tree of Life Ancient Egyptian Metaphysics and Cosmology for Higher Consciousness This isn’t a book I’ve yet had a chance to go through, but a while back I had taken to studying Crowley’s Book of Thoth tarot, and I’m really intrigued to see how this might relate and help with my understanding of Crowley’s tarot (and how both tie into Kemetic studies and my work with Anpu).